The expiry of the Viagra patent on Friday 21 June 2013 in several European countries including the UK was a hugely anticipated event in the pharmaceutical calendar, with generic manufacturers now licensed to produce ‘generic Viagra’ called Sildenafil, the name deriving from the active chemical name of Viagra sildenafil citrate. National news outlets covered the story with reports of tablets being available from as little as 60 pence each. Dr Fox started to receive numerous enquiries about sildenafil, it’s cost and availability. We stood ready on Friday 21 June at the Dr Fox offices, poised to add details of the newly licensed versions at much lower prices to our range of treatments available for Erectile Dysfunction … but no information was forthcoming from the pharmacy wholesalers. Over the weekend we received a price list for sildenafil that was not much lower cost than Pfizer’s own-brand Viagra – saving the customer on average £2 on a £24–£40 order. Unimpressed we added the generic sildenafil as an order option with the slightly lower price. Not surprisingly many users of our service contacted us to enquire if we had made some kind of mistake. By the following Tuesday sensible pricing was made available from the wholesalers: 66p per pack of 4 x 25mg; 85p per pack of 4 x 50mg; 94p per pack of 4 x 100mg. Sildenafil now cost a fraction of the price of Viagra and we immediately updated Dr Fox pricing for generic sildenafil treatment options. We expect many more manufacturers to make their own versions available over the next few weeks and months. Dr Fox prices will always remain the lowest – other UK online clinic services still maintain very high mark-ups on ALL medicine for erectile dysfunction. Sildenafil price comparisons. Prices accurate 23 August 2018 – sildenafil 25mg price, sildenafil 50mg price, sildenafil 100mg price. Pfizer also released their own version of generic sildenafil as a white tablet. Peculiarly, pricing of their own generic version is not very much lower than that of branded Viagra, despite being exactly the same ingredients. The widely-held expectation is that the market for sildenafil will grow as the treatment becomes more affordable. Viagra is restricted on the NHS due to cost and GPs generally will only prescribe a few tablets per month and generally only on a private paid-for basis. Currently (June 2013), only men with the following conditions are entitled to the drug on an NHS prescription (meaning they only have to pay the prescription charge). Update: As of 1 August 2014 the prescribing restrictions for sildenafil have been scrapped. 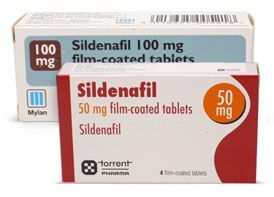 Given the price of sildenafil is now very low we would expect more GPs to start issuing NHS prescriptions for sildenafil. We also expect some users of Cialis and Levitra to switch to sildenafil due to its lower price. In the first week since the patent expiry, Dr Fox experienced a significant increase in men seeking treatment for ED using sildenafil. Posted on July 1, 2013 October 25, 2018 by Dr Tony Steele in Cost of medicine, Erectile dysfunction, Health News, Viagra/sildenafil.